It was a busy week for Harrisburg, with two games packed into three days on a cross-country trip to California, including one that set the league record for most fans at a regular season match. Here’s a review of that trip. The Islanders were able to put early pressure in the box, including a corner that was inches away from Pedro Ribeiro’s forehead at point blank range. However, it was Orange County that would score the first goal of the game in the 6th minute with a simple long ball to Christopher Santana that was poorly defended by the Islanders. Harrisburg continued to create the majority of chances, only narrowly missing an equalizer in the 14th minute as Jimmy McLaughlin curled a shot just wide of the top corner. Richie Marquez continued to impress at center back, shutting down what looked like a clear breakaway in the 20th minute. Both Marquez and Ribeiro have shown great one-on-one defending this year, but the Islanders again conceded a goal in the 24th due to a disorganized defense. Philadelphia Union loanee Cristhian Hernandez was able to manufacture the Islanders’ first goal of the season in the 43rd minute by winning a foul near the top of the box and then curling in a beautiful goal up and over the wall. The score at the half was 2-1 O.C. Blues, with two goals from Christopher Santana. The second half opened with great chances for both teams, the crossbar denied a Yann Ekra header, and then minutes later Islanders’ goal keeper Nick Noble made a save right on the goal line to keep Harrisburg in the game. Orange County extended their lead off a corner in the 73rd minute, Chris Cortez with the goal to make it 3-1. A broken offside trap in the 86th led to a second goal for Chris Cortez and a 4-1 win for the Blues. With only a two-day turnaround from the Thursday loss to Orange County Blues, the Islanders headed to Sacramento to play in the home opener for Sacramento Republic FC. This is Sacramento’s first season as a club, having joined USL PRO while repeatedly declaring that the team’s ultimate goal is to join MLS. Major League Soccer legend Preki is the first coach for the club and will look to reach the playoffs in his first season. 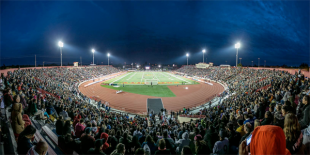 Over 20,000 fans showed up to Hughes Stadium for the match in a massive change of atmosphere after the sparse crowd in Orange County. The Islanders were quick to spoil the celebrations as Robbie Derschang snuck in a 5th minute goal with a great little chip shot over the diving keeper. Both teams settled in after the early goal with very few real chances being created in the first half. Sacramento would make history and score their first home goal in the 32nd minute off a set piece header by Adam Jahn. The game continued to get chippy towards the end of the first half with multiple fouls by both teams, but both teams were able to make it to the locker rooms without going down a man. Both teams came out firing in the beginning of the second half, and it took Harrisburg less than seven minutes to score and take the lead. Morgan Langley received a pass and pulled off a beautiful spin to beat the defensive line before slotting the ball right through the keepers legs to put his team up 2-1. Islanders’ keeper Nick Noble was quick off his line in the 57th to deny a shot on goal in the box. Adam Jahn continued to be dangerous with a few breakaways that had to be desperately covered by the Islanders’ defenders. The Republic dominated possession and chances late in the second half and nearly equalized in the 77th minute, with Noble making a reflex save on a low hard drive through traffic. Harrisburg finally attacked back in the 80th with a low shot that just trickled past the post and out for a goal kick. The Islanders would hold on for the full 90 minutes for their first win of the season. Morgan Langley: He continues to be one of the most creative attacking options for the Islanders. His skill created a chance for himself against Sacramento, which he topped off with a nutmeg on the keeper into the back of the net. His strike would end up being the winning goal and earn Harrisburg their first 3 points of the season. Finishing has been a problem for most of the attackers so far this season, but finally in these last two games the goals have started to flow. Nick Noble: Never underestimate the importance of a top class keeper. Week after week Noble makes amazing reaction saves in an attempt to keep Harrisburg in matches, as he has done for multiple seasons. He needs some help from his strikers and his defenders need to get their marking organized. The start of the season could have been a whole lot uglier without Noble between the sticks. Jimmy McLaughlin: McLaughlin very nearly opened his 2014 scoring account against Orange County with a right-footed curler that was searching for the top corner. Instead, his shot went wide, and he is still searching for his first goal of the season. Overall a solid performance against O.C. but the Islanders need those kind of chances to be converted. McLaughlin came on as a late sub against Sacramento and was able to help the team hold onto their lead and their first win. Cristhian Hernandez: Hernandez scored a beautiful free kick goal against O.C. Hernandez has shown his ability to draw fouls and take players on with the ball. Hernandez did not start against Sacramento. Pedro Ribeiro: Ribeiro continued to play well at center back, paired with fellow union loanie Richie Marquez. A strong presence in the air and on the ground, Ribeiro seems to be settling into his new position at Harrisburg. He was subbed off with a possible hamstring injury in the 69th minute. His injury status is unknown. Richie Marquez: Marquez is the Union loanee who looks most ready to get called up to MLS. He makes clean tackles in high pressure situations almost effortlessly. His confidence as the last defender is something that is very hard to teach. He looks like a capable MLS center back, even if he is only covering in that position for an injured Coady Andrews. However, for all of Ribeiro and Marquez’s defending talent, the team has suffered from an almost non-existent preseason. Once this defense has a chance to gel, don’t expect Nick Noble and crew to give up many goals. The Islanders now will enjoy a long stretch of home matches.